Landfarming is a well proven ex-situ bioremediation technology that has been successfully used since the 1980s for treating petroleum impacted soils/sediments, drill cuttings, low brine drilling fluids, oily sludges, tank bottoms and pit sludges. 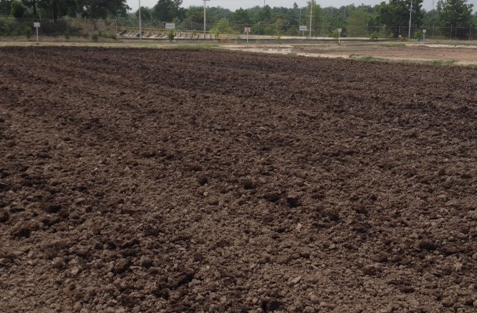 The material to be treated is incorporated into surface soil. Naturally occurring microbes in the soil and waste material transform the organic contaminants to carbon dioxide, water and biomass (). Maintaining optimum soil conditions for rapid biodegradation of organic contaminants can help meet cleanup goals within a reasonable timeframe. Bioremediation using the land treatment concept. Biotreating E&P Wastes: Lessons Learned from 1992-2003. During landfarming, the waste materials are typically placed as a layer on the ground surface with variable thickness. The waste is then tilled and amended with nutrients to enhance biodegradation by naturally occurring bacteria (Figure 1). Fertilizers such as urea and triple superphosphate (TSP) are used to provide nitrogen and phosphate necessary for biodegradation. Reduction in hydrocarbon concentrations can be expected within a span of weeks to months, depending on the initial concentration and composition of hydrocarbons, and whether the soil conditions are optimized for biodegradation. 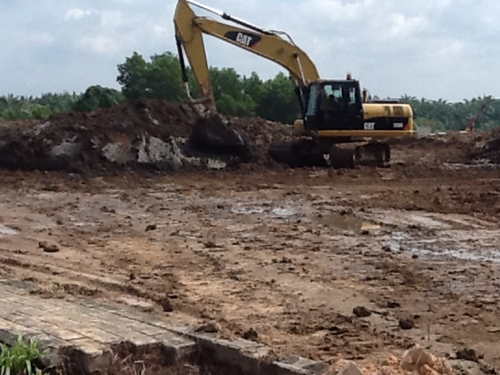 Once cleanup goals have been achieved, the treated material can be i) re-used in construction activity such as berms, landfill cover, backfill, regrading, or for agricultural purposes, ii) disposed at a landfill and/or iii) left in place and revegetated, depending on local regulations or site-specific considerations. Landfarming is a low-cost technology. Facilities are simple to construct and easy to operate. Standard construction and farming equipment can be used to move soils to the land treatment facility, to amend the soils with fertilizer, to apply water to the soils and to till the soils (e.g. 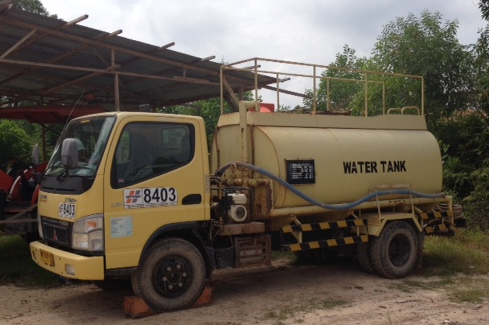 excavator, plow, rotovator, water truck). Figures 2 through 4 show examples of equipment used at a typical landfarming facility. It requires a large land area for treatment. There may be regulatory limitations on wastes that can be treated by landfarming. For example, U.S. regulations prevent landfarming soil impacted with hazardous wastes such as motor oil, hydraulic oil, and solvents. It may not be effective for highly impacted soils or soils impacted with severely degraded hydrocarbons (e.g. if soils contain >8% w/w petroleum hydrocarbons after spreading). Although landfarming is effective for reducing hydrocarbon concentrations, it is not effective for reducing concentrations of other oil field waste components, such as elevated concentrations of metals, salt or wastes containing naturally occurring radioactive materials (NORM). Concentration reductions >95% or final concentrations <0.1% may not be successfully obtained based on the extent impacted and nature of the hydrocarbons. Dust and vapor emissions may pose air quality concerns. Landfarming has been successfully used to reduce hydrocarbon concentrations in soils impacted with kerosene, diesel, jet fuel, and crude oil. It has also been successfully used to treat oil-based drilling wastes (drill cutting, low brine drilling), oily sludge, tank bottoms and pit sludges. There may be regulatory or permit limitations. For instance, in the United States, wastes that are not exempted under RCRA  such as motor oil, hydraulic oil, and solvents cannot be treated by landfarming by law. Wastes containing contaminants that do not biodegrade: e.g., NORM, metals or salt. The initial concentration and composition of hydrocarbons strongly influences the biodegradation potential of a waste. Figure 5. 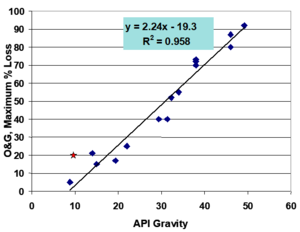 Correlation between API gravity (specific weight of the crude) and the predicted extent of biodegradation as measured by oil and grease (O&G). Wastes with >5% (w/w) of hydrocarbons may have physical and chemical characteristics that hinder biodegradation. For example, oily wastes tend to repel water, and can be poorly aerated. This can hinder or inhibit biodegradation. The molecular structure and molecular weight of hydrocarbons in the waste may make them either more or less susceptible to attack by microorganisms. Typically, aliphatic hydrocarbons are more readily biodegraded than aromatic hydrocarbons. Structurally more complex molecules such as isoprenoids and steranes are relatively recalcitrant to biodegradation. For crude oils, the API gravity is a reliable indicator of the composition of a crude oil and by extension, a good predictor of the biodegradation potential of a crude oil (see Figure 5). For example, a crude oil with API gravity of 40 (by virtue of its composition) may degrade by 75% within 4 weeks. A crude oil with API gravity of 25 may only degrade by 55%, and a crude oil with API gravity of 10 may not degrade more than 10% within that same timeframe. 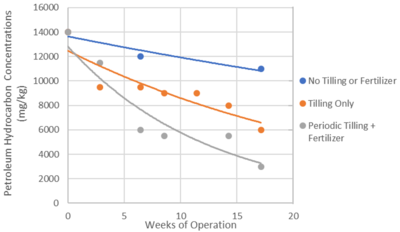 This same correlation can be used to determine the maximum initial hydrocarbon concentration that can be treated using conventional landfarming within 4 weeks and/or the maximum endpoint achievable for a given waste material. 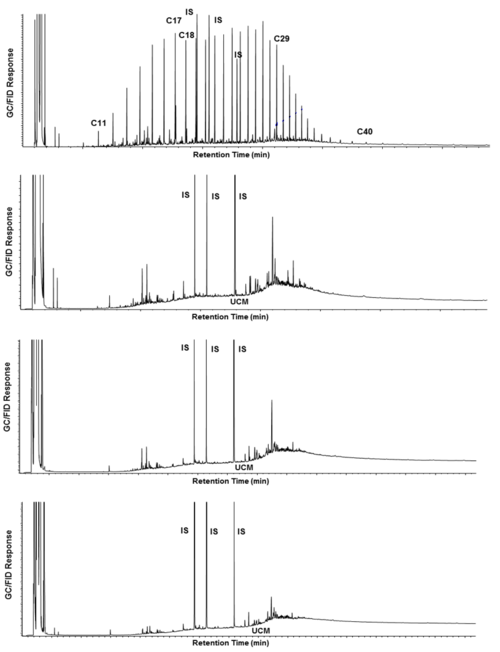 Using analytical methods such as gas chromatography to determine the quantity and composition of organic contaminants in a waste may be useful in determining biodegradation potential. Lighter ends (lower boiling point components that elute earlier in the chromatogram) will typically degrade faster than heavier end components. Light refined products, such as diesel and jet fuels, are highly biodegradable, similar to crude oils with API gravity >40. Heavy refined products like Bunker C or heavy fuel oils will biodegrade at rates similar to low API-gravity crude oils. Successful landfarm operation requires maintaining optimum conditions in the soil/waste materials (moisture, oxygen, pH and nutrient levels) to enhance biodegradation of petroleum hydrocarbons (see Table 1). Before beginning landfarm operations, the waste and the soil at the landfarm site should be characterized to establish the soil baseline characteristics and the need for soil additives such as agricultural lime for pH correction. pH 6 – 8.5. Agricultural lime can be added to increase soil pH. Aeration/Tilling Initially and every 2 – 4 weeks. Moisture Content 60% – 80% of water holding capacity (field capacity). Salt Content Electrical conductance of leachate <30 mS/cm (mhos/cm). Preferably <4 mS/cm for maximum reuse potential after cleanup. Ocean water has an electrical conductance of ~50 mS/cm. Total Nitrogen: 250 – 500 ppm. Action Level: 50 ppm. Nitrogen source should be added if nutrient concentration falls below action level (e.g. urea). Available phosphate: 125 – 250 ppm. Action Level: 25 ppm. Phosphate source should be added if nutrient concentration falls below action level (e.g. triple superphosphate). Maintaining optimum conditions for biodegradation is the key to achieving target cleanup goals within a reasonable timeframe. Figure 8 is an illustration of the effect of tilling and adding fertilizer on the rate of degradation of petroleum hydrocarbons. Fertilizer: Fertilizers can be added either manually or with mechanical spreaders. During landfarming, the nutrient conditions should be monitored, and additional fertilizer should be added if the concentration falls below action levels. Care should be taken not to add excess nutrients as it can result in fertilizer runoff and/or inhibit biodegradation. Moisture: Moisture should be maintained in the landfarm between 60 and 80% of the water holding capacity (field capacity) of the soil (roughly 15%-24% moisture by weight for most soils). For soils with less than 20% water holding capacity, some form of irrigation will likely be required. For water saturated soils, no tilling should be performed while the water content is high since this can impair soil texture. Irrigation water should be fresh. Low quality water may result in concentration of salt and subsequent inhibition of biotreatment. Aeration: Locally available agricultural equipment is most often used for tilling soils to break up clumps of clay and uniformly mix in amendments such as fertilizers, soil conditioners and water. Monitoring Needs: Commonly monitored parameters include hydrocarbon concentration, moisture content, nutrients, and pH. Parameters are monitored on a biweekly or monthly basis as needed to confirm that the biodegradation process is progressing smoothly. Landfarming has been successful in meeting cleanup goals for a variety of hydrocarbon impacted wastes within a reasonable timeframe (see Figure 9). It is important to note that reductions in concentrations of total petroleum hydrocarbons (TPH) that are greater than 95% of the original concentrations are difficult to achieve. It is also difficult to achieve a final concentration of TPH that is <0.1% of the dry weight of the soil. Cleanup goals for soils impacted with refined products such as gasoline may be lower than cleanup goals for crude oil based on risk to receptors and mobility of those products in the environment. Hoffmann, R., Bernier, R., Smith, S. and McMillen, S., 2010, January. A Four-Step Biotreatability Protocol for Crude Oil Impacted Soil. In SPE International Conference on Health, Safety and Environment in Oil and Gas Exploration and Production. Society of Petroleum Engineers. Huesemann, M.H., 1994. Guidelines for land‐treating petroleum hydrocarbon‐contaminated soils. Soil and Sediment Contamination, 3(3), pp.299-318. Lukić, B., Panico, A., Huguenot, D., Fabbricino, M., van Hullebusch, E.D. and Esposito, G., 2017. A review on the efficiency of landfarming integrated with composting as a soil remediation treatment. Environmental Technology Reviews, 6(1), pp.94-116. Maila, M.P. and Cloete, T.E., 2004. Bioremediation of petroleum hydrocarbons through landfarming: Are simplicity and cost-effectiveness the only advantages?. Reviews in Environmental science and bio/Technology, 3(4), pp.349-360. This page was last edited on 26 November 2018, at 14:22.